Ground Pound Down is a 4-player minigame found in Mario Party 5. The player falls from the sky into a Warp Pipe and onto the first block of soil. The screen then splits into four sections. The goal of this minigame is to get to the bottom of the cave or tunnel before the other players. 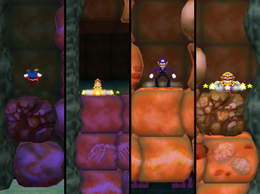 In order to do this, the player must, as the name suggests, Ground Pound their way down through rock blocks. Soil blocks require one Ground Pound to break, and rock blocks require three. If the player presses the button when they are on top of the jump, the player can break through more soil blocks with their ground pound. This has no effect on rocks blocks. There are three sections of blocks, each section having three columns of nine blocks each. Each column has a different amount of soil blocks and rock blocks. Players must choose one column to Ground Pound until they arrive at the next section. While Ground Pounding through one column, it is impossible to switch to a different one. The trajectory can be "divided" into three areas, depending on how far the player is from the starting point. Area 1: Has bright, orange blocks, most of which are breakable in a single pound. There should be, at most, two strong blocks. These blocks present fossils and stars carved or stuck on them somehow. This does not affect the block's hardness. Area 2: Offers a darker orange, as well as a darker background. The blocks present paw drawings on them, as well as different fossils or stones. There should be more rock blocks, but still not a relevant amount of them. Area 3: The last area offers the darkest view, as well as more exotic fossils, such as dinosaur fossils. Most of it is made of strong blocks. The last three blocks are all rock blocks. Although depending on the path taken, there can be two rock blocks at the end. The player who first reaches the pool of water at the bottom of the cavern wins the minigame. This minigame appears as the first minigame in Mini-Game Decathlon. Here, the player's objective is to reach the pool of water as fast as possible to earn as much points as possible, up to a maximum of 1,000. The default record for this minigame in Mini-Game Decathlon is 00:41.60. Also, the minigame ends once all players finish, or 01:30.00 pass. The ground rumbles, and the water gushes upward, sending the winner out of the pipe and into the middle of a desert. The winner then cheers as they are floating on the geyser created by the gushing water. Rules – "Do Ground Pounds to break the blocks and move down. Whoever gets to the water first wins." Advice 1 – "Time it so that you do a Ground Pound from the top of your jump to break more soil blocks." Advice 2 – "But no matter what, you must Ground Pound the rock blocks three times to break them." French Casse les Blocs! Break the Blocks! This page was last edited on May 22, 2018, at 05:33.